Today, at the weekly Friday protest in Kafr Qaddoum, a large number of Israeli Forces raided the village and fired large amounts of live ammunition, rubber coated steel bullets, stun grenades and teargas at Palestinian protesters. 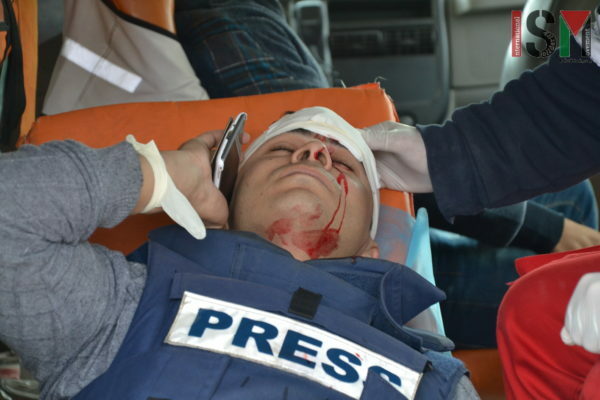 One journalist, from Palestine TV, was shot in the head with a rubber coated steel bullet. A group of masked Israeli soldiers also took his telephone, and deleted all of his pictures and videos from the demonstration. The journalist is alive, but will be hospitalized over the night. 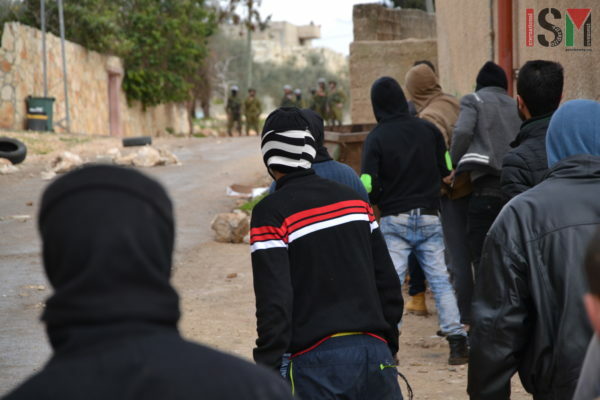 Later a large number of masked Israeli Forces raided the village, trying to arrest Palestinians, and entering the house of a Palestinian family, scaring the crying children. The protest started with a march at 12.30, after the Friday noon prayer in the local mosque of Kafr Qaddoum. 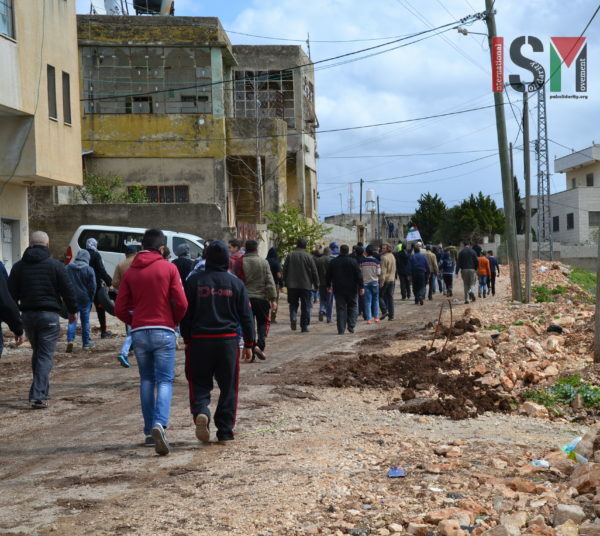 A large group of Palestinians, journalists, and a few Israeli and international activists marched from the mosque towards the closed road that used to connect Kafr Qaddoum with the large city of Nablus. After marching for around 30 meters, three Israeli Military jeeps and large numbers of Israeli forces arrived. 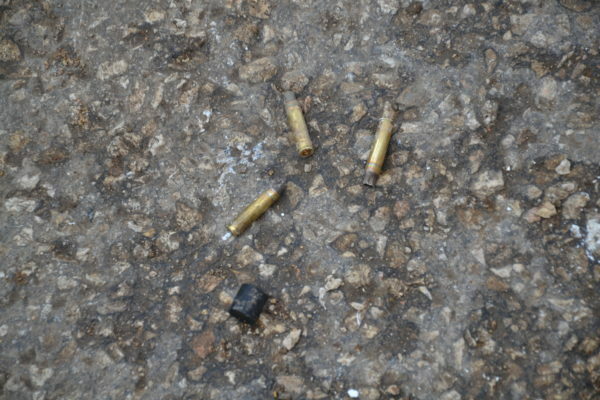 They opened fire on the Palestinian protesters, who retreated back further into the village. Between 1 PM and 3 PM, Israeli forces continuously fired live ammunition, rubber coated steel bullets, stun grenades and teargas at the Palestinian protesters. 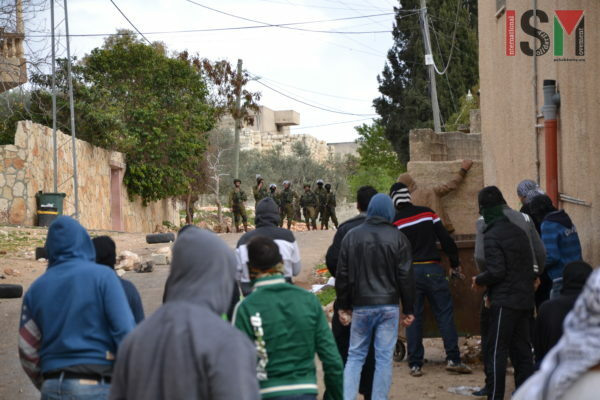 At several points, masked Israeli soldiers stormed the village, in an attempt to arrest the protesters. At one point, a large group of masked Israeli soldiers, entered the house of a Palestinian family, who were not participating in the demonstration. From outside the house, Palestinian children were heard screaming and crying, and Israeli soldiers were yelling intensely at the people inside the house. Ahmad, a journalist from Palestine TV, was shot in the head by Israeli forces with a rubber coated steel bullet, and was bleeding heavily from his forehead. Israeli soldiers also took his private telephone, and deleted all of the pictures and videos he had made of Israeli soldiers firing live ammunition at Palestinian protesters. The journalist is now hospitalized, where he will stay under supervision over the night. Palestinian journalist shot in the face by Israeli Forces with rubber coated steel bullets. Prior to the protest, Israeli Forces had also set up a roadblock at the entrance to the village, pulling cars over and checking people’s IDs, as an act of collective punishment. For five years the people of Kafr Qaddum have been holding weekly demonstrations, protesting the closure of their main road to Nablus and the expansion of the illegal Israeli settlement of Kedumim, which surrounds the village. In 2003, the road was sealed permanently by an Israeli roadblock, extending the fifteen minute commute to Nablus to about forty minutes. The roadblock has had severe economic consequences for the people of Kafr Qaddum, as many who once worked in nearby Nablus have had to seek alternatives. 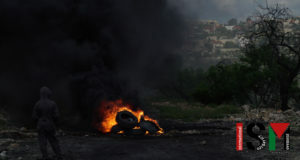 The United Nations estimates that movement restrictions imposed by the Israeli Occupation, such as the situation in Kafr Qaddum, cost Palestine about 185 million USD each year. After more than five years of weekly demonstrations, Kafr Qaddum continues to resist.